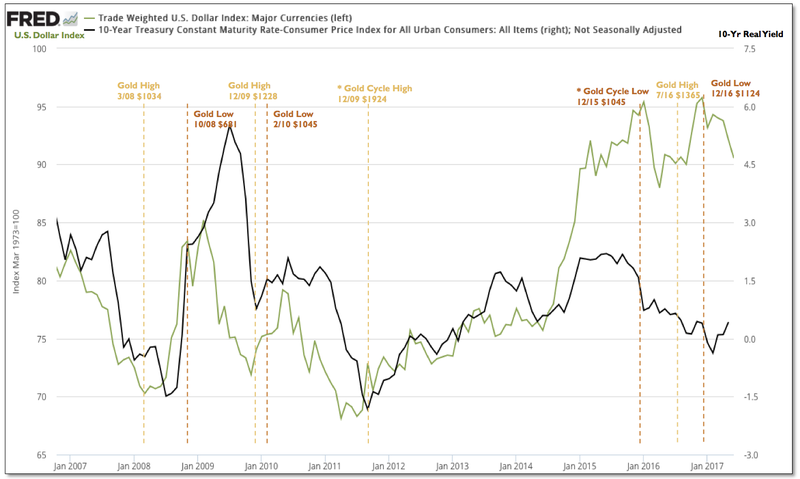 Market Anthropology: What's "Up" With Gold? The dollar continues to weaken, yet gold finds no incentive to rally. 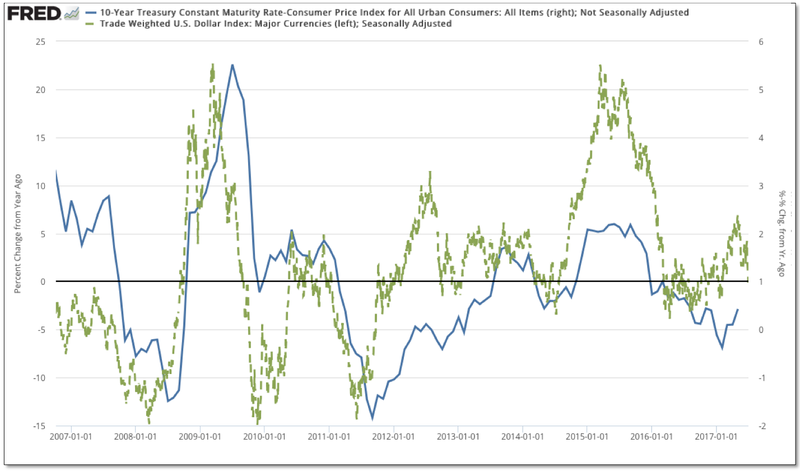 Fundamentally, in the basic real yield equation (nominal yields less inflation) – that arguably is the main long-term driver of the price of gold, the year-over-year inflation figures have underwhelmed of late. 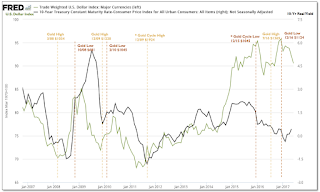 This is primarily because despite breaking down again from the highs last December, on a year-over-year performance basis the dollar has actually trended higher, essentially arresting the respective moves of higher inflation and lower real yields that began in the back half of 2015 – and which led the cyclical pivot higher in gold in late December of that year. 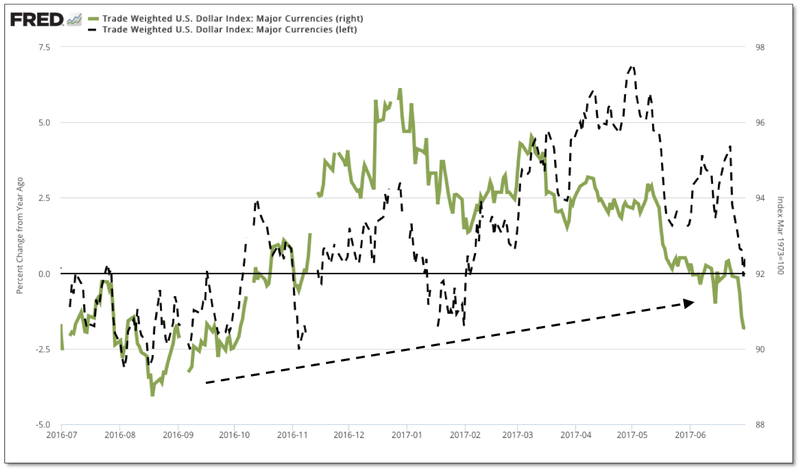 Big-picture-wise, the dollar has remained largely range bound over the past 2½ years. 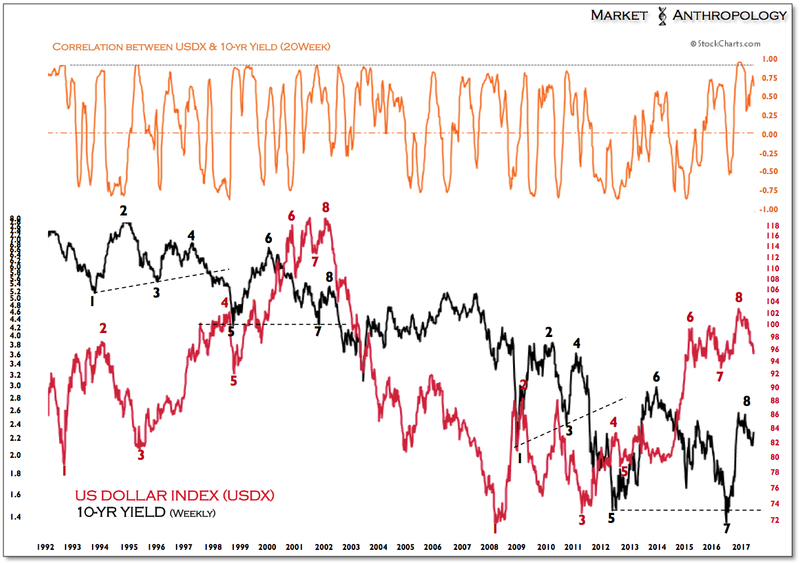 However, it's the dollar's relative performance (YOY) trend that has wagged inflation and the direction of real yields. 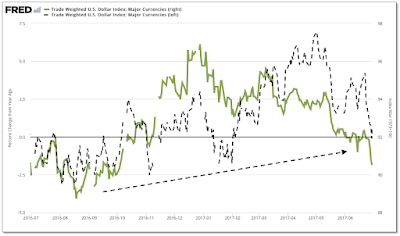 Until the dollar can break below the lows of last summer and fracture the very broad top that’s extended the range since 2015, both gold and the prospects for higher inflation/lower real yields will remain range bound as well. 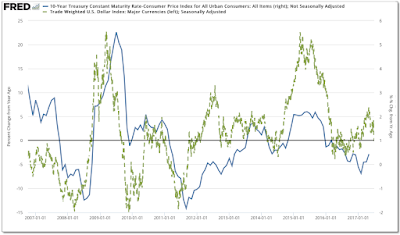 This perspective also applies to the numerating side of the real yield equation, as long-term yields – despite weakening again this year, are significantly higher than where they were a year before. 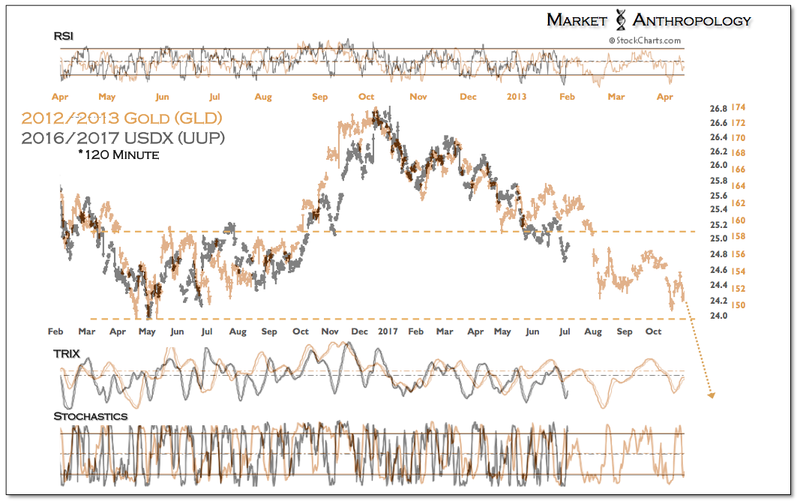 That said, the positive long-term development for gold is that although prices have recently been impacted by more hawkish policy expectations abroad – dragging US nominal and real yields higher, the dollar index has taken the next step lower beneath last November’s ephemeral post election breakout, with long-term support extending from the over 2½ year range directly below. Our expectations remain that the cyclical bull market in the dollar is over, and a breakdown below long-term support will rejuvenate the move higher in gold – as well as the next leg lower in real yields. 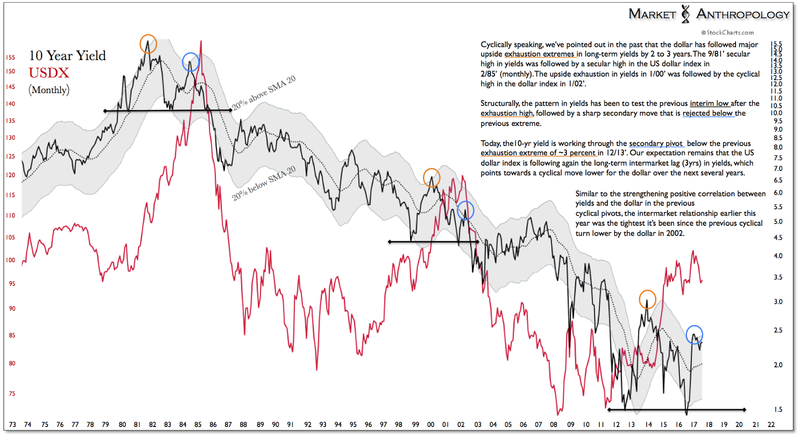 From our perspective, it is the dollar's relative historic extreme that presents the largest catalyst for a continued move lower in real yields and a resumption of the bull market in gold. The US dollar index continues to mimic gold's pattern breakdown from it's broad top carved across Q2 2011 to Q1 2013. Although gold will likely remain range bound this summer until long-term support is broken in the dollar, we'd speculate that as the dollar makes its way back to the lows from last summer, gold will regain a foothold as the retracement rally in yields also runs its course.